Tank Tops: This is the finalized the design for the sleeveless tops. They are made of a highly breathable fabric which is great for summer running, not just triathlon. The fit kit has arrived so you will have a chance to try on the samples. I will have try on sessions before the run on Thursday and again on Saturday since many of you still haven’t been by. Currently I have only 6 ladies confirmed for these shirts and we need a minimum of 18 to place an order!! They don’t run as small as the jackets – I have chosen a medium. The price point will be dependent on the number of tops ordered. (18-24 = 70.00, 25-49 = 59.00) Similar technical tops retail for 89.00-110.00. 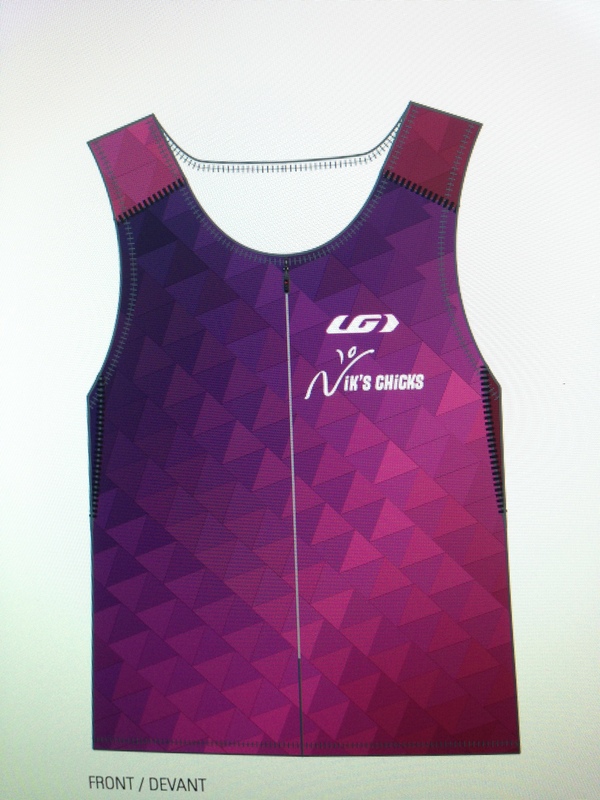 Here is a link to the Women’s Delphino Racer Top Louis Garneau Tri Top for more specific info.